Hardware subsidies for POS systems? Subsidizing a product to get a long-term use commitment from a consumer base is nothing new; it existed before high tech hardware was made affordable by software or service agreements. Think about the razors you buy, assuming of course that you’re not a fully bearded male. The initial cost of the razor isn’t all that expensive, but replacing the razors for a month costs upwards of twice the razor itself. And if you’ve shopped for a printer lately, you know the same strategy applies here. The printer itself isn’t the greatest expense over the life of the asset; the ink, which is required and usually specific to the device itself, is where you will spend the most money. The most well known form of subsidization, or at least most glaring, comes from the coupling of cell phones and cell service providers. An iPhone, for example, costs a lot more than most people actually pay for it. The new iPhone 5, the basic version with 16GB will run you $649. Not to mention the cost of new adapters, chargers, cases, etc. However, if you commit to (or renew) a two-year service contract with AT&T, Verizon, or Sprint, the phone itself costs $199. How does this work? The same way the printers and printer ink work. The service providers (i.e. AT&T) subsidize the majority of the cost of the phone in order to lock customers into a contract that ends up costing much more in usage and data charges over the life of the contract. The idea is to make the cost of entry relatively cheap. Then, the cost the company loses at the initial purchase is recouped through purchases, or service charges, over the long term. Unscrupulous? Not really, although some would say so after receiving their phone bill. But that has more to do with not being aware of the stipulations of the contract you sign to get the cheaper phone at the outset. Although I personally find it annoying, I try to look at as something akin to amortizing the asset, and remember that, at least for me, a monthly fee is easier than a bigger up front payment. So, why does all this matter in the world of point-of-sale (POS)? It matters because POS hardware and software is expensive. Smaller retailers, making it on a month-to-month basis often can’t afford the initial outlay for a POS system. 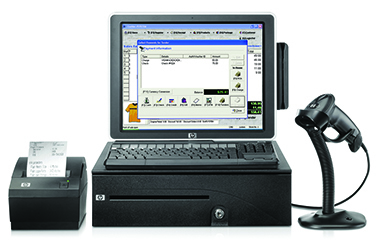 Recently, Harbortouch, a national supplier of POS systems, began giving away (for free) POS system hardware in exchange for a five-year contract to use their transaction processing services. The website says this is a limited-time offer, but no end date is readily visible. In February of this year, the program, already underway, was altered to transfer ownership of POS equipment to merchants after the five-year contract expires. Harbortouch started as a United Bank Card, a financial services company. So, they’ve found a good match in using their payment processing expertise to subsidize their POS hardware. It will be interesting to see if other POS suppliers move into this arena as pricing gets more and more competitive, and as hardware gets overtaken in revenue by software and potentially cloud systems. The trick is, the company has to be proficient and profitable in the sale of content or services. Take Amazon, for example. They can sell the Kindle at cost because the Kindle is a vehicle that drives consumers to purchase more of their content, where the real revenue comes from, and which Amazon’s business model is essentially built around. Another type of “free” POS solution is the free for x number of months, or free for x number of transactions. Take ZingCheckout, a cloud-based POS software that runs across all major platforms, including smartphones. So, a retailer can set up a PC and run the POS software over the Internet. ZingCheckout allows retailers to try the software free for two weeks. For retailers with under 50 products and 200 transactions per month, retailers can use the basic, free version of the system. The hope, for ZingCheckout, is that retailers who use their product will eventually grow and upgrade to the premium version of the service, and perhaps purchase a support plan. The premium version costs $49 per month per branch, and support plans start at $500. GoPago Live is another POS system that is offering the hardware free. The product includes a cash box, receipt printer, and tablet computer that is enabled for and connected with a (free!) 4G data plan. The way GoPago makes money is through a fixed credit card transaction fee of 2.85%. There is no fee on cash payments. The POS system business is changing. Customers are expecting less expensive hardware, and frankly less hardware in general. How fast most POS suppliers can adapt to the shift to service providers may just be the factor that decides whether they survive or not as the industry shifts. PointOfSale.com is a leading industry news site for the point of sale and payments industry.We are also the go-to resource for small business owners that want expert tips and inspiration on how to run a successful business. Collectively, our team of experts has decades of POS, payments, and small business experience.